2019 will be held soon at different centres. Selection of candidates for RRB Group D posts is based on written test, Physical Tests, Document verification, Medical Examination. RRB Group D Exam Syllabus/ Pattern details will be given in the Railway Recruitment cell Notification 2019. Last date for submission of application form online is 12-04-2019. Minimum qualifications for applying these vacancies are 10th pass, 10th pass plus ITI.. 10th pass posts are given separately. 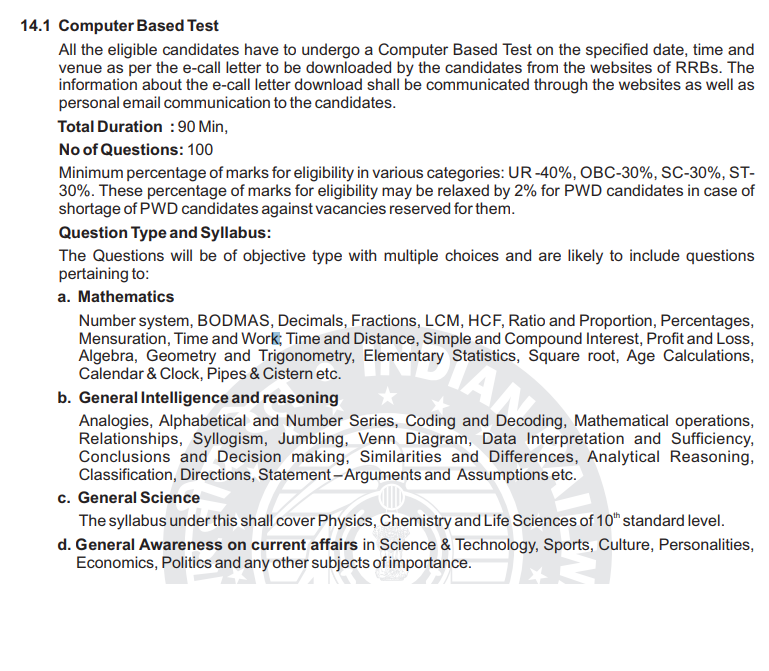 Candidates must have secured minimum qualifying marks to get eligible for physical tests. 1000 meters running in 4 minutes 15 seconds. Should be able to run for a distance of 1000 metres running in 5 minutes and 40 seconds in one chance. No Physical Efficiency test PET for PwD candidates. RRB Centers: RRB Hajipur/ Patna, RRB Kolkata, RRB Delhi, RRB Allahabad, RRB Malda, RRB Mumbai, RRB Ranchi, RRB Chennai, RRB Bilaspur, RRB Bhubaneswar, RRB Secunderabad, RRB Gorakhpur, RRB Guwahati, RRB Hubli, RRB Jabalpur, RRB Jaipur. Mode of selection for Railway Recruitment Cell Group D Jobs is based on following stages. Written exam consists of 100 multiple choice questions. Exam duration is 90 minutes. Syllabus for General knowledge/ awareness on current affairs: Important Events/ Days, Politics, Sports, Current Affairs, Cinema, Books, Authors, Science & Technology, Culture, Personalities, Economics, Politics and any other subjects of importance etc. 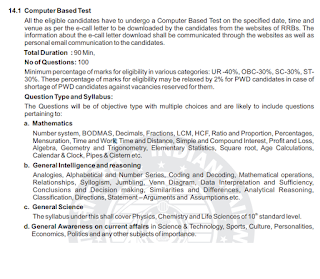 Syllabus for General Intelligence & Reasoning: Analogies, Alphabetical and Number Series, Coding and Decoding, Mathematical operations, Relationships, Syllogism, Jumbling, Venn Diagram, Conclusions and Decision making, Similarities and Differences, Analytical Reasoning, Classification, Directions, Statement – Arguments and Assumptions etc. Data Interpretation, Age problems, Series Problems, Data Insufficiency, Arrangement Problems etc. Syllabus for General Science: The syllabus under this shall cover Physics, Chemistry and Life Sciences of 10 standard level. Syllabus for Mathematics: HCF, Percentage, LCM, Problem based on Train, Boat and Stream, Distance & Time, Profit & Loss, Number System & Average, BODMAS, Decimals, Fractions, Ratio and Proportion, Percentages, Mensuration, Time and Work; Simple and Compound Interest, Algebra, Geometry and Trigonometry, Elementary Statistics, Square root, Age Calculations, Calendar & Clock, Pipes & Cistern etc. etc. Time duration for RRC group D written exam will be 90 minutes. Final selection list of candidates will be on merit basis of written test, Physical efficiency test PET, documents verification and medical examination. 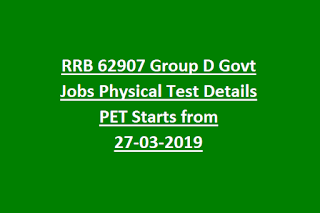 RRB Group D online application submission starts from: 12-03-2019 (10.00 AM). 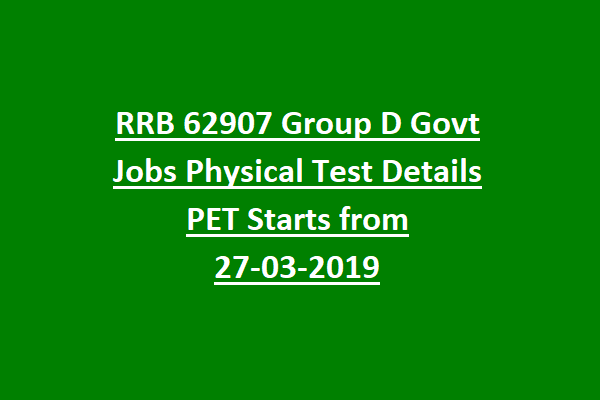 RRB Group D online application submission last date: 12-04-2019 (11.59 PM). Ex service man ka bhi physical test hogs sir??? ? Clearly mention nahi kiya notification pe. These are Group D posts. So physical tests hoga.